Glenfiddich 21 Year Old holds a special place in our range of whiskies, mainly because this expression is finished in Caribbean rum casks. Finishing it this way awakens the liquid, rousing it with extra exotic notes of ginger, fig, lime and banana and a vibrant spicy toffee warmth, elevating it from something great to something extraordinary. 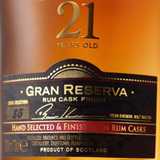 Finished in rum casks, the honey and orange zest aromas suggest a cocktail, not a straight pour of Scotch. These flavors are echoed on the silky palate, opening with cocoa and leather and evolving into a luscious, fudge-like finish, with hints of orange peel and cinnamon. Enjoy with a big rock of ice and a piece of orange peel, it needs no other adornment.